The comedian George Carlin said he had a rule: He would not eat any food that had a “y” and a “g” in its name. I have a similar rule as it applies to exercises. The way Carlin felt about yogurt is the way I feel about yoga. * I know it is a form of exercise and meditation that dates back centuries. * I know it is supposed to bring about inner peace and mindfulness. * And I know it is a great way to improve your flexibility and shape your body. But what no one tells you is how tedious and slow-moving it is! I guess that is part of the point, but look, I am a Type A personality. I want a workout that matches my personality, something that is going to rev me up, move at the pace of a New Yorker catching a train and leave me in a puddle of sweat. Yoga does none of those things for me. In fact, almost always after I have finished a yoga session, I feel like I have wasted a workout and I come away feeling tired and cranky. So much for quieting your mind. My wife and doctor have a theory that my allergic response to yoga is a gigantic signal that I need to be doing more of it. Oh, so the more I dislike doing something, the more I should do it because it is good for me? My native New Yorker response is something like: I’ve got your inner peace right he-yah! 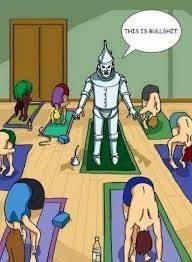 I have got rebar where my calf muscles should be and have about as much flexibility as the Tin Man in a rainstorm. Why do I want to torture (and embarrass) myself by getting into unnatural poses? Recently I have seen videos of people doing yoga with goats and yoga with cats. That’s cute and I guess the furry critters are there to keep boredom at bay and to keep your mind off the discomfort of the positions. There has got to be a better way to get those endorphins released and get that mental high. Oh yeah, I know what it is: cardio and weight training done in a tempo that leaves you breathless. Some exercise routines I do, in fact, have yoga poses, particularly in the warm-ups. If my wife is in the room watching, she’ll point and say emphatically: “yoga.” My response is suddenly to have an itchy neck that requires me to scratch it with four fingers moving under my chin in her direction. I think Carlin, a comic genius who was known for his list of seven words you can’t say on television, was right about yogurt – and by extension, yoga.